The Wall Sculpture :: For the Roses was the second wall sculpture that I made. I had picked up that book for some reason before the concept of hanging altered books entered my mind. When I was looking for books to work with, the title immediately made me think of roses blooming on the page. I cut the center sections out and then painted the back sides of the pages in darkening degrees of pink. I cut out little star shapes and folded them back, which created the the roses. My sister says they look like stars, but I see roses. I cut and folded pages of the book for the vines that I wove in and out of the pages before I glued them shut. I really like the way this book looks on the wall. I’m working on another flower-themed wall hanging right now called Anatomy of Paradise. It’s taking me a while to get it finished because I have to keep leaving home to take care of my mom. I have a hard time working on a project if I can’t stick with it over time. I like to just sit down, start, and then work and work until it gets done. If I have to put it down and pick it up, I get frustrated; I lose my rhythm. So right now the vines and leaves and blossoms for this altered book are lying all over my work space and have been for about three weeks. I can’t seem to sit down and continue working cause when I get back from my parents’ house, I have so much to catch-up with at home. I thought this summer I would really be able to focus and create. It’s just not turning out the way I had imagined. 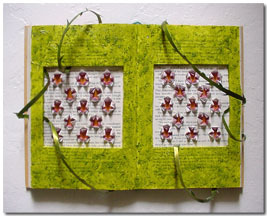 Altered Books, Musings, Wall Hangings. permalink.